How natural and cool does this large flat screen TV look in this space, arranged with shelves? The look is a bit like a deconstructed built-in, allowing for display areas without the walls. This works well for anyone designing a TV wall on a budget, too, since you can find affordable shelving pieces just about anywhere, from Ikea to Home Depot to your local hardware store. Before flat-screen TVs, we hid our electronics in huge armoires. Now it seems everyone is finding new uses for those large pieces of furniture—such as up-cycling them as craft cabinets or mini offices—because the thin profile of today's TVs have brought them out in the open. Which begs the question: how do we decorate around a TV that's meant to be on display? From a gadget-lover's perspective, this challenge is actually a great thing; however, those more concerned with aesthetics might not be as pleased. Flat-screen TVs—particularly ones mounted above the fireplace mantel—present a design challenge; but, luckily, there are several ways to decorate around those large black rectangles. There's so much pleasing symmetry in this photo! You can try flanking your TV with some nice greenery of course, but we think the show-stopping idea here is to surround your flatscreen with colorful books, arranged in a cascading rainbow of colors on two shelves above the TV as well as on towers to the left and right. There's nothing wrong with arranging your furniture so that the TV is the focal point, but when it's not being used, you end up staring at a big, blank, black rectangle. Make your TV part of a gallery wall by surrounding it with framed art. Jenna at Rain on a Tin Roof took this one step further and even painted the wall black so that the TV recedes even further into the background when it's not in use. Add interest and texture to the wall on which a flat-screen TV is mounted by using vinyl wall decals. This non-permanent solution is great for renters because they can be removed without damaging the wall. The design you choose should detract but not compete with the TV. In other words, this is probably not the place to use a quotation or song lyrics. Think dots or subtle stripes... Something that reminds you of a low-key wallpaper design. In family rooms where the TV is almost always on, don't try to hide the action. Dress up the mantel with just a simple, long and low arrangement like this wooden planter box that can be filled with different things as the seasons change. A row of pillar candles, or a grouping of short, square glass vases would also work. Alternatively, you could flank the TV with two taller arrangements of items. If you go this route, don't feel you have to stick to only one item on each side as shown here. Get creative and form symmetrical groups of three objects, like a set of wall sconces, matching vases, and a pair of candlesticks, for example. If your home is blessed with built-ins, make them the star instead of your TV. 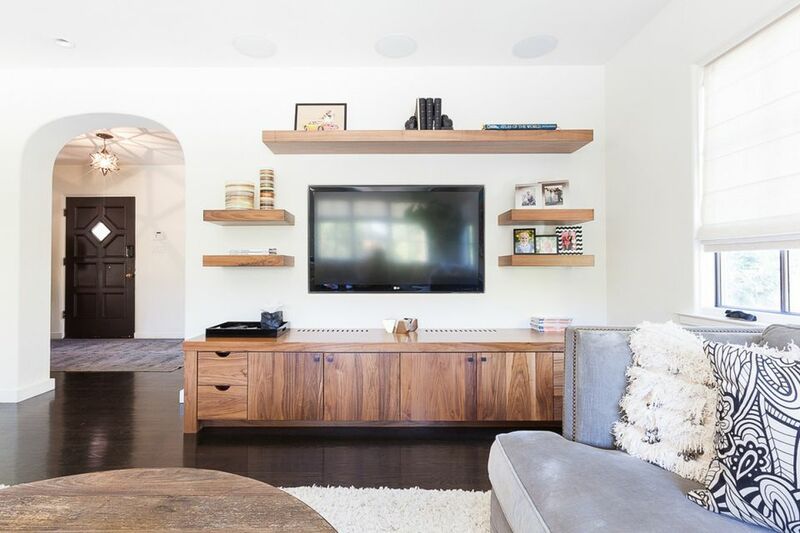 Fill your built-ins with carefully selected and artfully arranged accessories that draw attention away from the TV when it isn't being used. Don't have built-ins? Consider flanking your fireplace with two tall, freestanding bookcases instead. In the event that your TV is rarely used, or you just really don't like looking at it, hide it completely with a wall-mounted TV cabinet that disguises your flat-screen with mirrors or art panels. This is a great solution for more formal rooms used for gatherings that don't involve watching Netflix or football games.